Is there a rule about the length of the game? How long can a game of table tennis last? What happens if both players keep the ball in play? Can they continue playing forever? Do the rules of table tennis say anything about this? Well, yes, the rules of table tennis do cover this eventuality, and since the change to the 11up scoring system in 2001, there's now a time limit of 10 minutes per game. 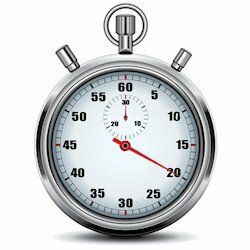 If a game is unfinished after 10 minutes AND fewer than 18 points have been scored (i.e. score has not reached 9-9 or 10-8), the game continues to a conclusion using the expedite rule. 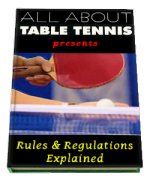 But before we go any further, let's take a quick look at the history of table tennis to see why this rule came into existence, and then take a look at what the current rule says. Although the history of table tennis can be traced as far back as the late 1880s, the game we know today started in the 1920s when Englishman Ivor Montagu and other Europeans formed the International Table Tennis Federation (ITTF) in 1926. But it didn't take long before problems started to arise with the basic table tennis rules. Many players had adopted a defensive style of play and their games were taking longer and longer to reach a conclusion. In fact, this caused a major controversy at the 1936 World Championships when the first point in a match between Poland and Romania lasted for over two hours! Because games were becoming longer and longer, a new rule was created to place a time limit of 20 minutes on games in World Championship events. At the same time, all countries affiliated to the ITTF were asked to pursue measures to discourage their own players from using the defensive tactic of "pushing". 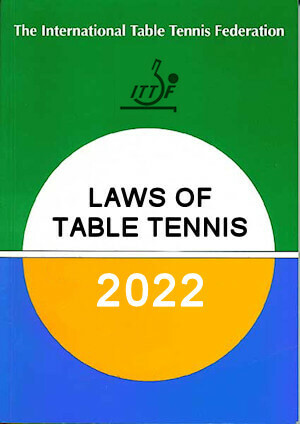 The basic table tennis rule at the time (1935) was Law 5 which stated that the player who first scored 21 points was the winner, unless both players had reached 20 points, when a two point lead was required. But for World Championship events, a new rule was added to the laws of the game, over-riding and additional to Law 5. Provided that, where a game be unfinished 20 minutes after its commencement, the Umpire shall award the game to the player (or pair) leading, unless the two players (or pairs) shall be at equality, when he shall announce without interrupting play: "Five minutes more - the next point wins" and award the game to the player (or pair) scoring the next point. If no further point shall have been scored, and the score thus remains at equality, after the further five minutes period thus permitted, the Umpire shall terminate the game, awarding it to neither player (or pair). In the case of a game being terminated by the time limit as above, where this is not a deciding game, the match shall continue with the next game. Also, if a match did not have a clear winner, both players would be disqualified from that event. And, if the event was a team event, each player would also be liable to additional penalties as determined by a disciplinary committee. So, clearly this was a serious issue! However, it was to be another 25 years before further changes were made to this rule. The player shall be permitted to hit the ball 12 times excluding the service stroke, and if all such strokes are safely returned by the opponent, one point shall be scored by the opponent. The server for the point interrupted shall serve for the first point after the interruption, and thereafter the service shall alternate after each point whilst this rule is in force. Where, in a match, this rule has been applied in one game, it shall be applied 10 minutes after commencement in each of the subsequent games of the match. So the new rule was that games would last a maximum of 15 minutes before the Expedite rule came into operation. After 15 minutes, the game would be interrupted. It would then restart with the onus effectively placed onto the server to play offensively. This was because the new rule stated that if the receiver made 13 good returns, he would win the point. And, in order to reduce the time taken to play subsequent games, a maximum of only 10 minutes was allowed before the Expedite rule was enforced in those games too. The 1965 revision applied only to games which were played after the Expedite rule had already been enforced in an earlier game. Where, in a match, this rule has been applied in one game it shall be applied 10 minutes after immediately at the commencement in each of the subsequent games of the match. This meant that once the Expedite rule had been used in one game, all subsequent games in a match would use the Expedite rule from 0-0. So each player would have one serve each, and if the receiver made 13 good returns, the receiver would win the point. Subsequently, a number of countries suggested that, if both players agreed, the Expedite rule should come into force at the start of a match, rather than wait 15 minutes for the inevitable to occur between two defensive style players. However, this suggestion did not receive the approval of the ITTF at that time, so no changes were made. When the use of sponge covered rackets became widespread in the decades that followed, the need for an Expedite rule gradually diminished. Fewer matches were unfinished after 15 minutes play because players were able to play more offensively with sponge covered rackets. So the Expedite rule was usually only required when two defensive style players competed against each other. And so it wasn't until 1997 that the Expedite law was modified again. And then it was only a small change - to make it clear that it could not come into operation if both players or pairs had scored at least 19 points. The Expedite rule was amended further when the scoring system changed from 21up to 11up in 2001. Because games would now be shorter, the time limit was reduced from 15 minutes to 10 minutes. 2.15.02 Thereafter, each player shall serve for 1 point in turn until the end of the game and if the receiving player or pair makes 13 returns the receiver shall score a point. The Expedite rule was last modified and restructured in 2010. The wording was amended to clarify that the expedite system will not come into operation if at least 18 points have been scored. Previously the rule stated that the expedite system would not come into operation if the score had reached 9-9. And the opportunity was also taken to tidy up and restructure the other wording too. 2.15.01 Except as provided in 2.15.2, the expedite system shall come into operation after 10 minutes' play in a game or at any time requested by both players or pairs. So, after many refinements to a rule which was first introduced in 1936, the current rule states that games can only last for a maximum of 10 minutes play before the Expedite rule comes into operation, unless at least 18 points have already been scored. If at least 18 points have already been scored, the game continues to a conclusion - however long it takes. If at least 18 points have NOT been scored after 10 minutes play, the game will be interrupted by the umpire. It will then restart with the onus effectively placed on the server to play offensively. Each player will serve alternately until the end of the game. If the receiver makes 13 good returns, the receiver will win the point. There is no further time limit imposed on the remainder of that game. But in order to reduce the time taken to play subsequent games, all subsequent games in that same match will use the Expedite rule from the start of the game - so for example, if you are playing a match which is the best of five games and Expedite is implemented in game one, games two through five will start using the Expedite rule from the beginning i.e. when the score is 0-0. But with the modern game now being all about fast attacking, offensive play, we rarely see the Expedite rule being required in top level matches. However, it is still a part of the rules and so it still prevents matches lasting too long.